Flourishing: A Frank Conversation about Sustainability invites you into a conversation between a teacher, John R. Ehrenfeld, and his former student now professor, Andrew J. Hoffman, as they discuss how to create a sustainable world. Unlike virtually all other books about sustainability, this one goes beyond the typical stories that we tell ourselves about repairing the environmental damages of human progress.Through their dialogue and essays that open each section, the authors uncover two core facets of our culture that drive the unsustainable, unsatisfying, and unfair social and economic machines that dominate our lives. First, our collective model of the way the world works cannot cope with the inherent complexity of today's highly connected, high-speed reality. Second, our understanding of human behavior is rooted in this outdated model. Driven by the old guard, sustainability has become little more than a fashionable idea. As a result, both business and government are following the wrong pathat best applying temporary, less unsustainable solutions that will fail to leave future generations in better shape.To shift the pendulum, this book tells a new story, driven by being and caring, as opposed to having and needing, rooted in the beauty of complexity and arguing for the transformative cultural shift that we can make based on our collective wisdom and lived experiences. Then, the authors sketch out the road to a flourishing future, a change in our consumption and a new approach to understanding and acting.There is no middle ground; without a sea change at the most basic level, we will continue to head down a faulty path. Indeed, this book is a clarion call to action. Candid and insightful, it leaves readers with cautious hope. Start reading Flourishing: A Frank Conversation About Sustainability on your Kindle in under a minute. "John Ehrenfeld's thinking about our species and our place in the world is indeed a thing of beauty, as Andrew Hoffman's intelligent dialogue with him brings out on every page. If you're tired of stale books on 'sustainability, ' read this for new insight and inspiration." --James Gustave Speth "author of America the Possible: Manifesto for a New Economy "
"The most a dangerous time for any radical idea is when it becomes popular and people assume that because they embrace the idea they are 'doing it.' The window is closing for consciously altering the trajectory of global industrial expansion. There are no simple answers, but there are core questions and critical actions to take. In Flourishing, these are clearly illuminated by John Ehrenfeld and Andy Hoffman, two of the most experienced and thoughtful leaders in the sustainability movement." --Peter M. Senge "MIT, Society for Organizational Learning, Author of The Fifth Discipline, and Co-Author of Presence, and The Necessary Revolution "
"A fresh, daring look at sustainable business. It takes no prisoners and does not try to please--it simply tells the brutal truth." --Joel Makower, Chairman and Executive Editor "GreenBiz Group Inc. "
"For those who are familiar with Ehrenfeld and Hoffman's arguments, the conversational approach in this book develops nuances that take key messages about sustainability and flourishing to a new level. Those not yet familiar are also in for a treat with this easy-to-read, yet critically important manifesto." --Jennifer Howard-Grenville "University of Oregon and author of Corporate Culture and Environmental Practice: Making Change at a High-Technology Manufacturer "
John R. Ehrenfeld is a long-standing and influential voice in the sustainability debate. He was Director of the MIT Program on Technology, Business, and Environment. From 2000-2009, he served as Executive Director of the International Society for Industrial Ecology. He continues to do research, write, and teach, most recently at several emerging MBA for Sustainability programs. He is the author of Sustainability by Design: A Subversive Strategy for Transforming our Consumer Culture.Andrew J. Hoffman is the Holcim (US) Professor of Sustainable Enterprise at the University of Michigan. He serves as Director of the Frederick A. and Barbara M. Erb Institute for Global Sustainable Enterprise. Hoffman is co-editor of The Oxford Handbook on Business and the Natural Environment, author of Builder's Apprentice: A Memoir, and co-author of Memo to the CEO: Climate Change, What's Your Business Strategy? John Ehrenfeld (JE) doesn't see "sustainability" as increased energy efficiency or "green technology." Instead he sees it as "flourishing[:] ... a metaphor that captures happiness, health, and the many characteristics of what humans believe is a good life. And it captures a sense of the health of the natural world" (@22). He believes that the usual corporate tactics to promote sustainability, through sustainability scores for products, corporate social responsibility programs, etc., miss some essential points: (A) sustainability is a property of a whole interconnected system, not of a specific enterprise within it, and (B) it can't be reduced to a few quantitative dimensions. (Not all corporations have the wrong idea: he says some interesting things about a Patagonia ad campaign to encourage people not to buy the company's products if they don't really need them, and to buy them used rather than new, when possible (@122-123).) JE very elegantly and accurately characterizes the usual meaning of sustainability, deriving from the 1987 UN report, "Our Common Future" (a/k/a the Brundtland Report), as "try[ing] to hold onto the world we have now by doing things better." This means, among other things, continued economic growth. But, warns JE, such "business as almost usual" can't lead us forward to sustainability as flourishing. What we need is a "shift" in the "dominant culture" (@120), "a shift in our view of ourselves first from one of Having to one of Being, and second from one of Needing to one of Caring" (@83). This involves, among other things, changing our patterns of consumption, and abandoning economic growth as a goal. JE sometimes comes up with some very apt "sound-bite" formulations, such as the Brundtland report characterization above, or that "[T]he prevailing belief that I am what I own stands firmly in the way of any sort of redistribution" (sc. from rich nations to poorer ones, @72). He brings critiques of consumption down to earth when he notes tersely that "Consumption is an essential part of life. Amoebas consume. All life consumes."(Id.) But the frequency of such verbal nuggets, and of practical illustrations, tapers out a bit toward the end of the book, where the the level of the discussion tends to be quite philosophical and general. I concede, though, that maybe one reason the book takes that turn is to provide a salutary shock to some readers, by demonstrating that an MIT engineer who advises businesses can nonetheless consider philosophy to be very important. I found myself in agreement with JE far more often than not. But I confess he began to lose me when he emphasized the contributions of Martin Heidegger to his view, including crediting Heidegger as the pioneer of bringing Caring into philosophy (@89). Heidegger joined the Nazi Party in 1933, remained a member throughout the Second World War, never expressed regret for his involvement, and indeed was still writing in an ultra-nationalistic, Nazi-era rhetorical style more than decade after the war ended. To be fair, the work of Heidegger on which JE relies, "Being and Time," was written in the late 1920s, and JE mentions that he himself is Jewish and that Heidegger is "controversial." Nonetheless, it was a bit discomfiting to read his paraphrase of Heidegger to the effect that "who we are ... is determined by the culture we live in. ... Each human being becomes whoever they are by learning from and existing within a culture that embodies and endows that human being with the knowledge of the world that it takes to live effectively. To me [i.e., JE], that is getting to the essence of sustainability-as-flourishing." (@26.) Decontextualized from the rest of Heidegger's life perhaps this can sound benign or insightful, but it's hard to forget that Heidegger clearly believed that one particular culture was superior to all others. There is a faint from-the-sublime-to-the-ridiculous echo of the Heidegger/"Caring" dissonance when JE elsewhere describes "fishing as love" (@8). JE always releases (at least some of) the fish he catches -- but instead of painfully hooking them, pulling them out of the water and suffocating them for a while, and then tossing them back in wounded and terrified, wouldn't it be at least as loving simply to leave the fish alone? Or does the lovingness consist in helping the fish experience the "authenticity [that] springs from anxiety in the face of death," another paraphrase from Heidegger (@95)? I don't for a moment doubt JE's sincerity that he independently lit upon the word in the way he described. But to say "as I write," while discussing Sen, of all people? The capabilities approach to well-being has been based on a notion that's been called "human flourishing" since at least the 1980s. As developed by Sen and philosopher Martha Nussbaum, it's *far* more prominent in social science than are JE's ideas, with all due respect. Moreover, the word was picked as a translation of the ancient Greek word "eudaimonia," which (along with related grammatical forms) was used by many authors to connote a true happiness -- most prominently by Aristotle, whose sense of the word in his Nicomachean Ethics is the one Sen and Nussbaum follow. Neither Aristotle, nor Nussbaum, nor the widespread use of "flourishing" in the literature on well-being are mentioned in this book. (JE's 2009 "Sustainability by Design," which also talks about flourishing quite a bit, omits both Sen and Nussbaum, and discusses Aristotle's Nic.Eth. without mentioning eudaimonia at all.) If JE's nuance is to include all of nature, and not just humans, under the term "flourishing," then the book could simply say so, while acknowledging the earlier use of the term. At best, this book's origin story about "flourishing" is symptomatic of the way it overemphasizes the uniqueness of JE's thought, without seeming fully aware of just how much work has been done by others along the same lines (namely, lots more than is suggested by JE's passing references to Herman Daly, Tim Jackson, Juliet Schor and Richard Heinberg). Some of this lack of historical perspective might be related to the book's being published under Stanford U. Press's business book imprint. I also suppose it was the SUP editor, or lack of same, who failed to catch that Adam Smith's ideas weren't "put forward ... nearly four hundred years ago" (@41), but less than 250 years ago. In sum: JE seems like a very interesting person with whom to have a conversation. He makes many well-aimed remarks about why sustainability as currently practiced is useless and hypocritical, especially in the earlier chapters. But the high level of generality in the latter half of the book makes it seem targeted more to MBAs who aren't used to thinking about the big picture, than to readers who are looking for a practical vision of how to get off the unsustainable path we're stuck on. Nicely articulated arguments for a different way of approaching our societal and personal goals. Worth reading and does not belabor the points. Superb and in depth discussion of the dire necessity to contemplate sustainability in a world that is consuming far too much of our natural resources. 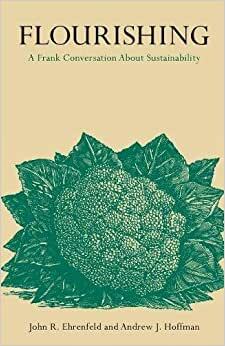 Simply a revolutionary book on a very current conversation, this book helps the novice better understand the difference between simple sustainability and the concept of flourishing. This book is set up in an interview style format with each chapter opening up with a reflection from the authors. This dialogue format allows the reader to feel as though they are a part of an intimate conversation.